Vocation | Scuffalong: Genealogy. Vocation – Scuffalong: Genealogy. I’ve written of Cousin Tilithia Brewington King Godbold Dabney here and here. Her restaurant in Norfolk, the Strand Cafe, made a deep impression on my grandmother, who laughingly recalled waiting tables there on childhood visits and being dazzled by Cousin Tilithia’s menu offerings. More from the Norfolk Journal & Guide — my great-uncles J. Maxwell Allen and William J. Allen. My grandmother: He had a brother that was a barber. His name was Golar, and we called him “Doc.” Papa had him in there. Papa had a chair, and Doc had the second chair, and Walker had the third chair. 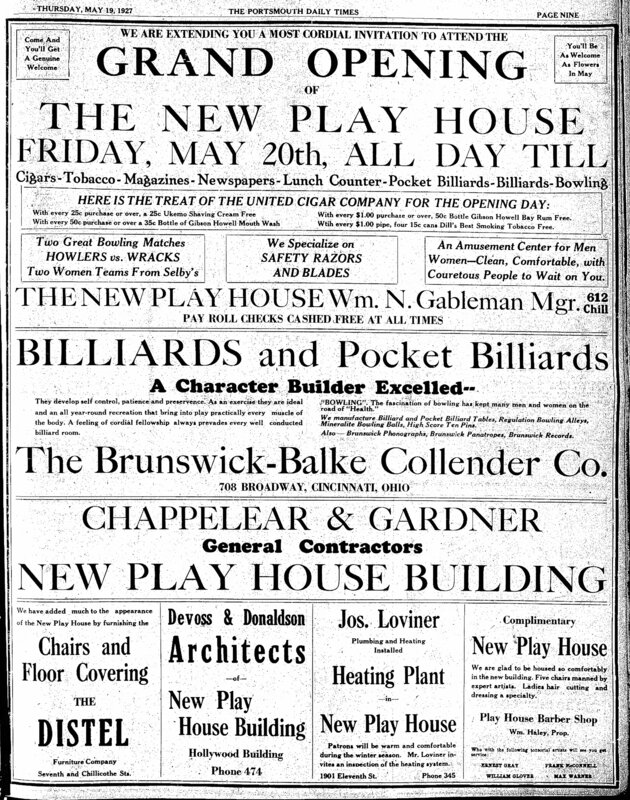 Harvey Golar Tomlin was the only one of Harriet Nicholson Tomlin Hart‘s second set of children to see the twentieth century. Harriet and Abner Tomlin had as many as six children together, but I only know the names of three — Milas, Lena and Harvey Golar. They did not stay long. In 1902, Harriet gave birth to Bertha Mae Hart, whose father Alonzo she married in 1904. 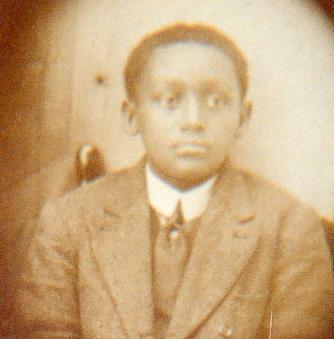 By 1910, Harvey Golar, called “Doc,” had left his mother and stepfather’s household and was living in the Wallacetown neighborhood of Statesville with his half-brother and family: Lon W. Colvert, a barber, wife Caroline, and children Mattie, Gola, Walker, Louise, and Margaret (my grandmother). He trained under Lon and went to work in his shop. 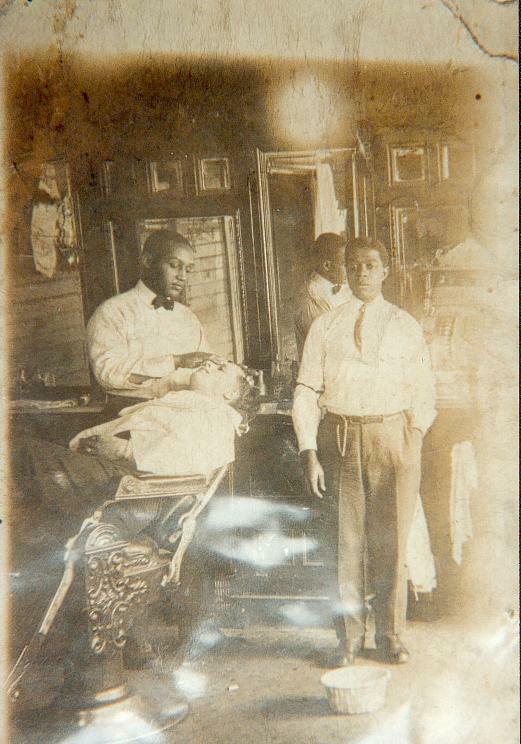 In the photo below, which can be dated to 1917 by another taken at the same time and showing a calendar, Doc appears with Lon’s son Walker and a client. On 11 Jan 1917, H.G. Tomlin sold a parcel of land to L.W. Colvert and wife Carrie Colvert for $10. In a deed filed at Iredell County Courthouse, the land was described as “Beginning at a stake at a post oak, Ramsour’s old corner, running North 88 W. 16 1/2 poles to a stake on road East of the track of the A.T. & O. R.R. ; thence S. 8 W. 9 1/2 poles to a stake Pearson’s corner; thence S. 88 E. 16 1/2 poles to a stake; thence N. 8 E. 9 1/2 poles to the beginning, containing one acre more or less and being the identical lands conveyed by William Pearson and wife to Abb. Tomlin by deed, dated 19th day of June, 1891 and recorded in deed Book No. 17 at page 101 of the Records of Deeds of Iredell County.” Doc apparently had inherited the property from his deceased father, though I’ve found no estate file. Doc was possibly liquidating his assets as he pulled up stakes in Iredell County. Five months later, he registered for the World War I draft in Middlesboro, Bell County, Kentucky. (Middlesboro, Kentucky? What was the pull? The push?) Though he was prime age and had no infirmities, I have no evidence that he ever served in the military. The 1920 census shows the family in the north Statesville suburbs: Jessie Stockton, age 28; his sister Flossie Tomlin, age 25, a public school teacher; niece Anna L. Tomlin, 4 month; and brother-in-law Havey Tomlin, age 26, barber. Doc’s last-place listing in the household is telling. Was he really there? Or tacked on as an afterthought because, after all, he was Flossie’s husband? There are clues. Both Flossie and Doc were enumerated twice in the 1920 census. On Garfield Street in Statesville, public schoolteacher Flossie Tomlin and her daughter Annie L. appear in the household of Flossie’s brother Eugene Stockton, his sister-in-law (technically, but in reality his common law wife) Ida M., and their four children. 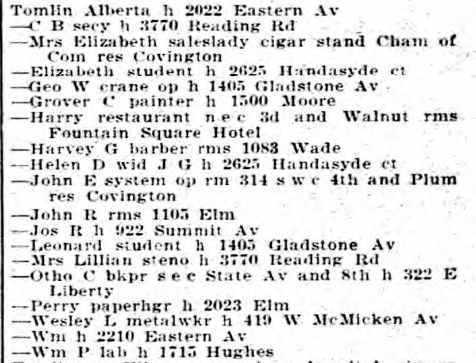 The enumerator recorded this household in January 6, 1920. Seven or eight days later, however, 200 miles away in Lynch, Harlan County, Kentucky, another censustaker recorded 26 year-old North Carolina-born barber Harvie Tomlin as a roomer in the household of barbershop manager Alex R. Simpson and his wife, Lina. Then on March 3, Flossie and Annie were recorded in Jesse’s house, above. I’d bet money that Doc was actually in Kentucky. I don’t know where Doc spent the 1920s, but it was more likely that he drifted around the Appalachian Plateau than returned to Statesville. There are glimpses. 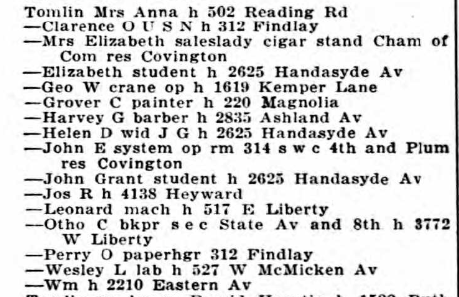 The 1930 census found barber Harvey Tomlin in Carnegie, Allegheny County, Pennsylvania, living at 205 Broadway in the household of Sabry Goldsmith, a 35 year-old Florida-born barbershop proprietor. He was described as single. However, on 6 July 1933, in Newport, Campbell County, Kentucky, Harvy G. Tomlin, 40, colored, divorced, born in North Carolina to Ab and Harriett Tomlin and a resident of “Cin. O.” married Lena R. Simpson, 49, colored, widowed, born in Kentucky to John and Elizabeth [no last name reported]. Thomas Hanly, J.P., performed the ceremony before Helen Peddiford and Helen Byers. The couple had applied for the license in neighboring Kenyon County, Kentucky. 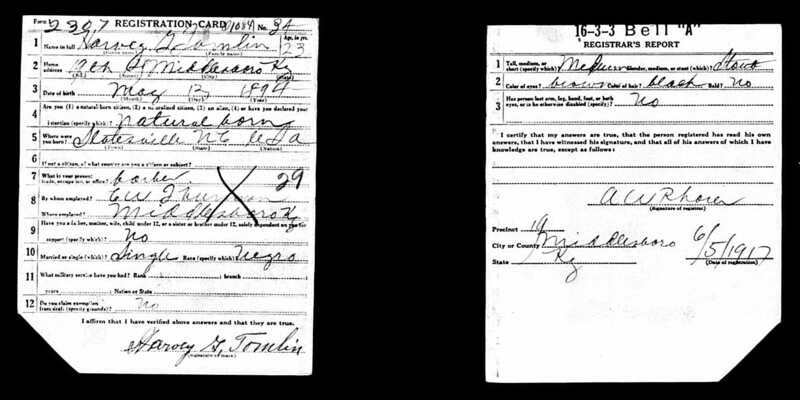 Lena Simpson, you may recall, was married to Doc’s employer and landlord at the time of the 1920 census. 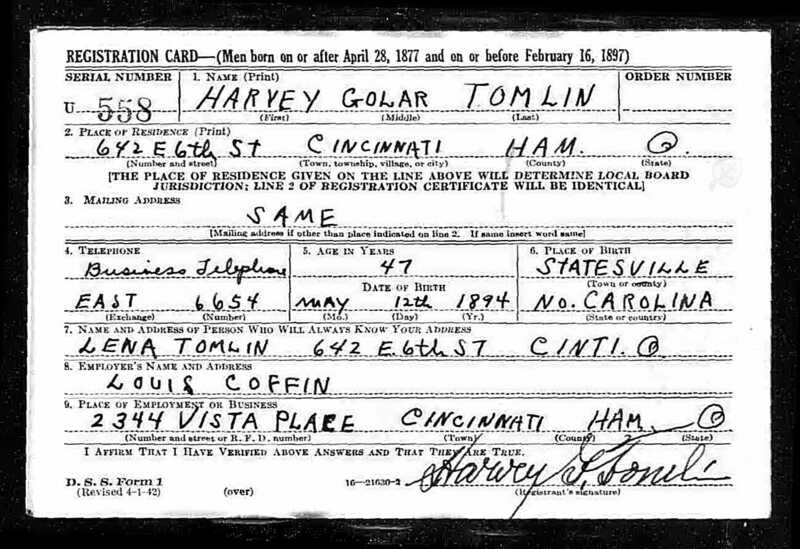 Two years later, despite a negligible chance of being called up, Harvey Golar Tomlin registered for the World War II draft in Cincinnati. The back of the card noted that he was 5’4″ tall and weighed 198 pounds and that he had brown eyes, black hair and dark skin. 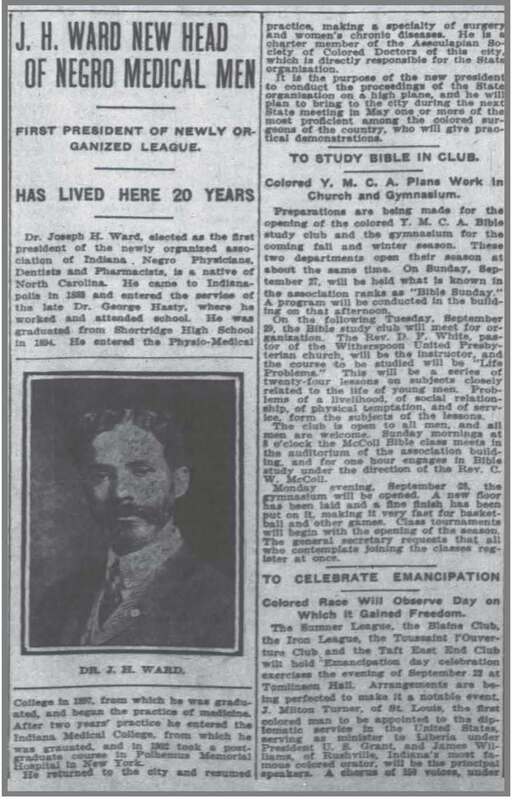 The following year, Doc returned to Statesville to obtain a so-called delayed birth certificate. 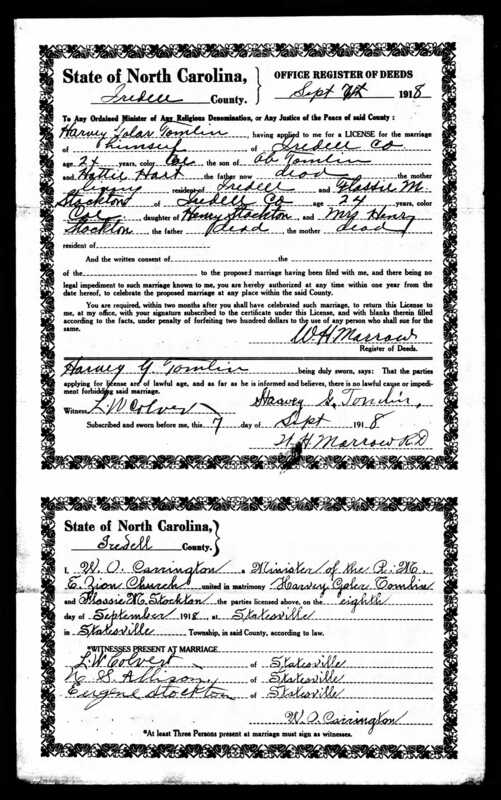 It was filed on 31 July 1943, showing that Harvey Golar Tomlin was born 12 May 1894 in Statesville, that his birth was attended by Dr. Long, and that his parents were Abb Tomlin, colored, born 1852 in Iredell County, and Harriet Nicholson, colored, born 1862 in Iredell County NC. I lose sight of Doc for more than a decade until the Statesville Record & Landmark posted a brief article on 8 June 1955 mentioning that Bertha Hart Murdock had left half-interests in a lot to her brother “Harry” G. Tomlin and niece LaVaughn Schuyler. Lena Tomlin died 17 July 1959 in Cincinnati. Doc did not grieve long for he was back in Statesville getting married six months later. In another small-world, keep-it-in-the-family moment, Doc’s third wife, Mary Bell Frink, was the widow of William Luther McNeely, whose sister Caroline married Doc’s brother Lon Colvert. It was a short-lived union. On 8 May 1961, Harvey G. Tomlin, son of Abbe Tomlin and Harriet last-name-unknown, died in Statesville of coronary thrombosis. He had been living at 229 Garfield Street (Ida Colvert Stockton lived at 214 Garfield) and working as a butler. I’ve been able to find very little about Doc’s only child. 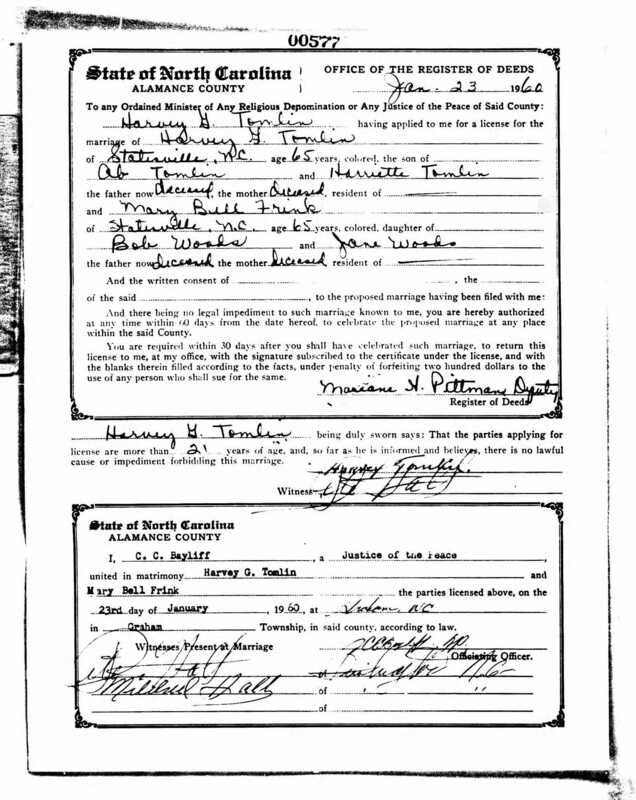 Social Security records indicate that Lavaughn Tomlin married a Scruggs in about 1943 and a Schuyler about 1953. She lived in Jamestown, New York, in the 1940s and died 30 May 1997 in Salisbury, North Carolina. An abstract of her death certificate reveals that she had worked as a registered nurse. She was my grandmother’s first cousin. Did she know her at all? My grandmother: And he [her brother Walker Colvert] got a girl pregnant, and Papa sent him to Kentucky rather – so that he wouldn’t have to marry that girl. Me: What did he do in Kentucky? Grandma: He was a barber out there. Interview of Margaret C. Allen by Lisa Y. Henderson; all rights reserved. A hostler was a groom or stableman employed to care for horses in a stable, often at an inn or hotel. Fletcher Reeves, Charlotte NC – husband of Angeline McConnaughey Reeves; hostler, J.W. Wadsworth and others, circa 1880-1912. Robert Wooten, Goldsboro NC – husband of Mary J. Henderson Wooten; hostler, circa 1910. Ned Barnes, Raleigh NC – hostler and coachman, circa 1910. Jack Henderson, Wilson NC – hostler, J.W. Farrior Stables, circa 1910.